While reading the last issue of Uncle Scrooge and the second part of Scrooge’s Last Adventure, I noticed a few interesting names. 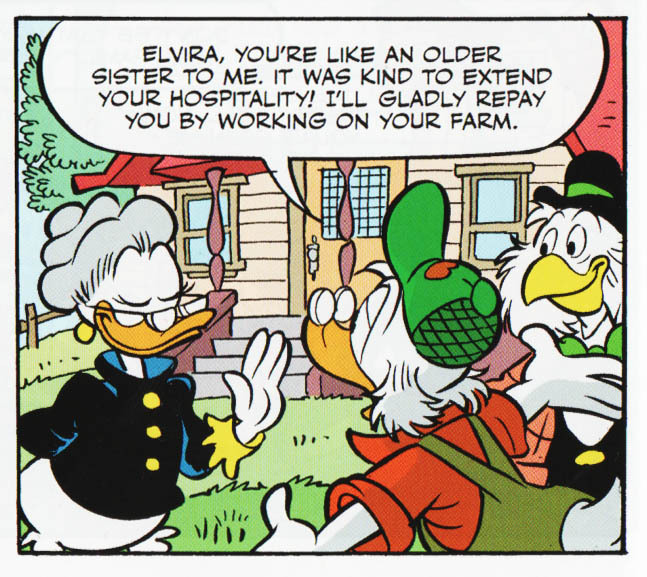 Then Grandma Duck is called Elvira by Scrooge. That name is most commonly known from Don Rosa’s family tree and The Invader of Fort Duckburg. 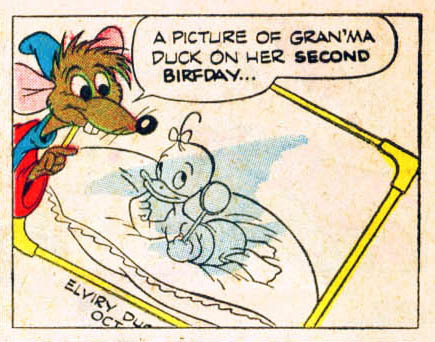 But I think the origin of the name is from a Grandma story in Walt Disney's Comics and Stories #121, although in a slightly different form. Emily's usually been Emily since 1990s Don Rosa—an occasional story has referenced it. Quackmore had just his surname in the USA until now. 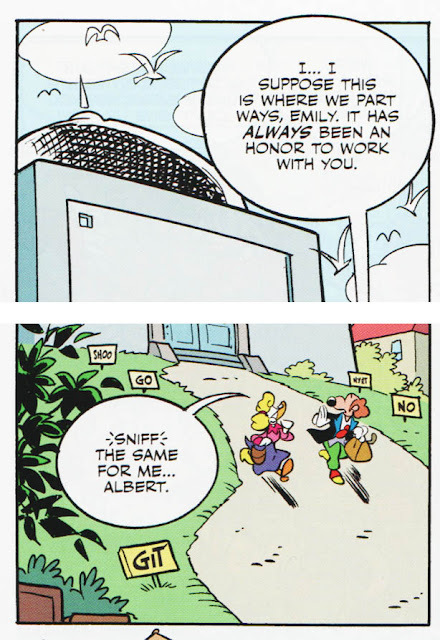 As a first name, Albert (etymologically a bit like the origiinal "Battista") originated at Egmont; Jonathan Gray chose to use it here in "Scrooge's Last Adventure", and I was all for it: it made the sad scene of himself and Quackfaster a little more personal and thoughtful. That’s right, I should have known/remembered the name Emily. It’s first used in The Richest Duck in the World I believe, when she is hired as Scrooge's secretary. Sometimes I get a bit confused with the different looking secretaries. In my head they are two different persons with the same name. "Emily's usually been Emily since 1990s Don Rosa—an occasional story has referenced it": that's interesting, do you have a list of stories where Quackfaster is called Emily? Beside Don Rosa's original use in Lo$ part 11, I only know of a single instance in which the name Emily was used again, and that is in an Italian story (I TL 2959-2) from 2012 (see https://goo.gl/r1a0Vr). 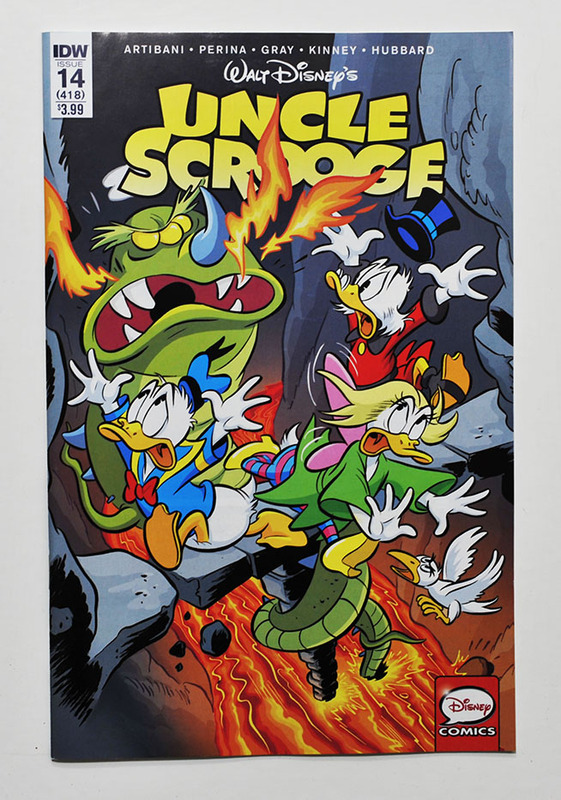 I don't count "Scrooge's Last Adventure" because the name Emily is not present in the original but was added by the translator (see https://goo.gl/Tj7wn3). 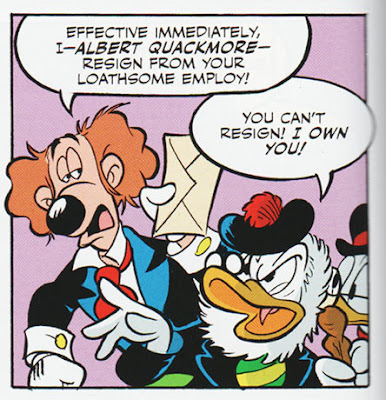 As for Battista's English name, I think it was a good idea to fuse the names Albert and Quackmore into a full name of Albert Quackmore. Interesting enough, his surname in the Italian verson is still unknown. But I am curious to know this: is Quackmore a name used in real life? I only heard it for Donald's father and the English name of Battista.